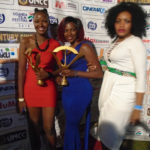 Home Features Did Monitor’s Mwanguhya hit a jackpot at ACME awards? 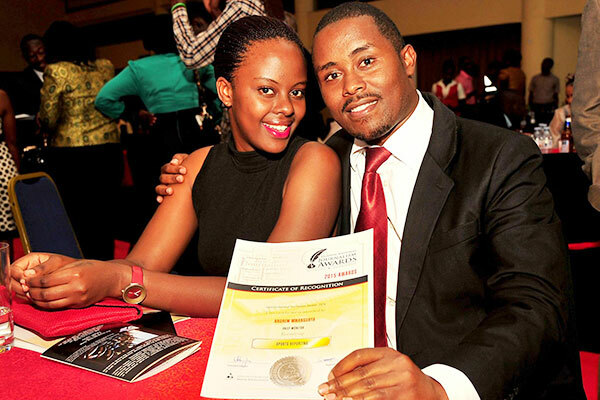 Did Monitor’s Mwanguhya hit a jackpot at ACME awards? Monitor sports reporter Andrew Mwanguhya (L) poses for a picture with a friend. While many journalists turned up for Uganda National Journalism Awards 2015 at Golf Course Hotel on Wednesday with adrenaline running wild like for a 13-year-old girls about to break her virginity, Andrew Mwanguhya was grinning like an Indian betting firm manager on a weekend of upsets. The Early Bird was quick to deduce two reasons: First, the Monitor sports reporter was assured of winning, and secondly, if he did not win, he had already won. It was all in the date. 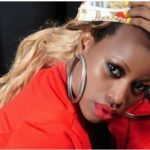 The sultry, nippy and and ‘hippy’ date Mwanguhya turned up with for the award was worth more than the plaques and Shs2.5 million The African Centre for Media Excellence was awarding winners. Such was the night that while many ran their lips dry, mouths bitter and tongues sour, The Love Dre, as Mwanguhya is known by his close friends, was in his own cloud despite seeing the sports journalist of the year award go to an unknown reporter from Arua. The Love Dre drove home in his sleek Altezza sports car with Shs1 million cash prize for the runner-up accolade, but The Early Bird is not sure the guy even arrived with the money, let alone the certificate–he probably lost them while paying attention to his love. As the pictures show, the sultry date was more than imaginations can coin in the bathtub on a lonely night when armed with Geisha soap. Could this be the riddle to explain why the guy has stubbornly remained single? Has he been waiting for this bird? Meanwhile, The Early Bird was quick to snoop around for the scent of the cologne the date was wearing to find clues as to her identity. We are told that the chick is called Kashaija and is a dropdead that causes jams around Mubs and Nakawa quiet often. We are yet to find out if Kashaija is a student or not. Surely, with such an item by your side, what is a mere ACME award? The Love Dre was surely the happiest loser of the night.